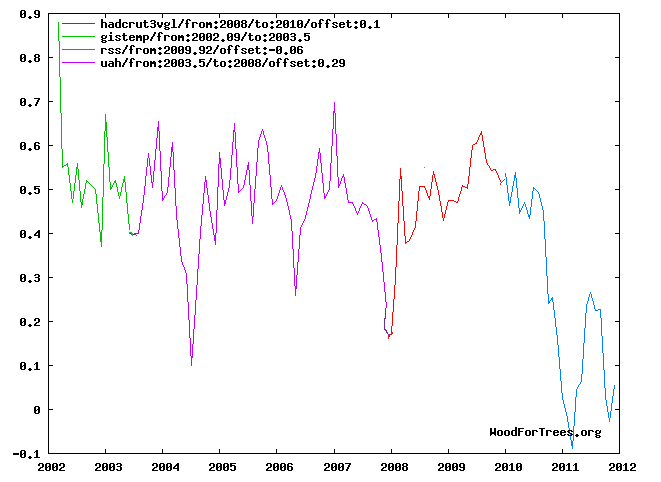 The True Decadal Temp Trend!!! It took me a while, but after a lot of reflection, I realized we were looking at our temps wrong. This has been very unscientific of us. If we’re going to challenge the scientists in a skeptical manner then we need to utilize their scientific methodologies! It is a small wonder why we can’t convince the EPA and our politicians that our position is correct when we don’t approach the question like our well educated scientists do! Well, I’m not standing for this anymore! We need to act more scientific, and by golly! I’m just the man for the job! Ladies and Gentlemen, I give you the true decadal temp trend! Utilizing the several data bases and methodologies we can plainly see the temps have dropped nearly a full degree over the last 10 years! I’d like to take all the credit for this very scientific methodology, but, I can’t. I’m really only using the same approach some of our most celebrated scientific experts have already employed. So, I must give credit where credit is due. My inspiration for this very scientific and credible approach is none other than the CU Sea Level Research Group University of Colorado!!! I would encourage all to send a special thanks to all of the guys and gals there. Some of them are, Prof. R. Steven Nerem, Dr. James Choe, Dr. Dallas Masters, Dr. Gary T. Mitchum, and Dr. Don P. Chambers. I’m not sure if this is all inclusive or not. There may be others to give credit to, as well. I’d also like to give a shout out to the people at SkS for hanging in there so long with us. And a warmist commentator at WUWT, Erinome . I bet they thought we’d never see the light! Oh, and for the specific work of science which inspired me to such heights, without further ado……….I give you the ever rising sea level graph!!!!! You see, climate science can be fun if you just do it right!! 9 Responses to The True Decadal Temp Trend!!! I like to see deep adherence to morals and integrity. And that’s what ‘global warming’ is all about! ………….We need to act more scientific, and by golly! I’m just the man for the job! lol, yeh, I might spoof Mann one day in the future. Great idea! I’m not sure what you’re saying, but I like it. lol, yes, this might be a bit cryptic for some. I’m poking CU in the eye. The sea level graph is done essentially the same way I pieced the temp graph together. I saw it one too many times. So now, I’ll put a graph built just like the way they built their graph. It is every bit as valid! I am suprised you did not find some Cherries at NCDC. I forgot. That is not Cherry Picking, it is using the “Best” data available. Ohhh……. I like!! This climatology is easier than it looks!